A hearty creamy soup with double smoked bacon, sausage and cabbage that is just packed with flavour. With all of the freezing cold weather that we have been having over the last few weeks I have been in full on soup mode and I have been trying some new ones. By far my favourite so far is this soup from the description of one of the soups of the day at Porchetta & Co here in Toronto. 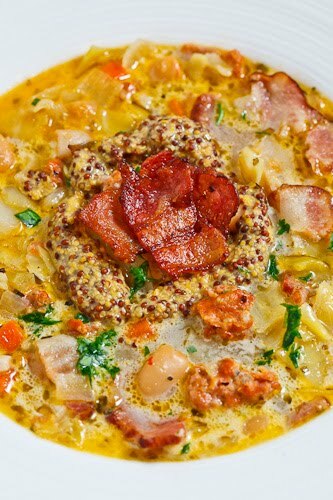 The soup was described as containing cabbage, double smoked bacon, sausage and white beans and it was topped with a garnish of grainy mustard. I was immediately sold on the idea and I knew that I would have to try the soup! The only problem was that as a daily soup I could not count on it being there when I went so I decided to make it myself. I started out by cooking some hot Italian sausage long with the double smoked bacon in a saucepan to start building up the flavour. I then moved on to the soup trinity of onions, celery and carrots which I cooked in the rendered bacon grease followed by healthy dose of garlic. The soup was described as being creamy and since it also contained beans I decided to get some of the creaminess by pureeing half of the beans in a food processor so that I would be able to cut back a bit on the heavy cream. To maximize the flavour I use a homemade chicken stock which was pretty much the final piece of the soup. This creamy cabbage and double smoked bacon soup is easy to make and it is just packed with flavour! The beans add a really nice creaminess to the soup and I especially enjoy the smokiness that the bacon adds. I have been hooked on grainy mustard ever since I discovered it a while ago and using it in soups is particularly nice. In the past I have simply mixed a tablespoon or so directly into the soup but using it as a garnish on the soup like I did here was also amazing! Luckily I have enough of this tasty soup leftover to keep me warm for the rest of the week! Heat the oil in a large sauce pan over medium-high heat add the sausage and cook until cooked, about 7-10 minutes, breaking it up as you go and set it aside. Add the bacon to the same pan and cook until the fat renders, about 7-10 minutes and set it aside reserving 1 tablespoon of grease in the pan. Add the onion, carrot and celery and saute until tender, about 10-15 minutes. Puree half of the beans in a food processor with some of the chicken stock. Add the chicken stock, sausage, bacon, beans, pureed beans, cabbage, oregano and bay leaf and bring to a boil, reduce the heat and simmer until the cabbage is tender, about 10-15 minutes. Season with salt and pepper, mix in the cream and parsley and remove from heat. Serve garnished with grainy mustard. Slow Cooker: Implement steps 1 & 2, optionally implement steps 2 & 3, place everything except the cream and parsley in the slow cooker and cook on low for 6-10 hours or high for 2-4 hours before adding the cream and parsley. Bacon AND sausage? It is 75 now in Texas, but I may just have to make this soup anyways. This soup is loaded with deliciousness! Love it all. If u just take out the bacon then this soup is so similar to Indian vegetable soup with all those lovely ingredients! Lovely recipe! This is the ultimate soup, kevin! Oh YUMM Kevin! This one really appeals to me. I love cabbage soup – childhood comfort food, and this version looks amazing. I have tried many of your recipes to great success and can't wait to make this one! A fabulous soup! so tasty and comforting. what a delicious looking soup! yum! What a fabulous soup idea – cabbage and bacon and sausage meat! Always looking for recipes with cabbage, I love it. And the fact that there is bacon makes it better. I have to admit, I was a little wary when I read the title of this…but then I realized it had white beans. And bacon. And the doubt lifted. Beautiful! A hearty soup, perfect for the cold winter weather. Have you ever made your own sausage? This sounds lovely and I may have to make it tonight. I used your guidance for my French Onion soup the other day – yum yum! I'm sick as a dog today… your soup would make me feel a 100 times better…. wish I could reach into the screen and grab some. wow, Kevin, what a layering of flavors! Your photo looks as tempting as all the ingredients going into this soup! Great recipe as always! What an incredible-lookings soup this is. Just perfect for the cold weather we're having here in the UK this week. Those are some of my favourite flavours and garnishing with the grainy mustard is a really original idea. I love it! I just love winter and soup, especially one that is packed full of meat and vegetables. Yum! This looks very delicious! In Hungary we eat this kind of soup very often. Congratulation to your blog, I saw lots of fantastic recipes. Kevin – sorry I haven't visited in a while. All of your dishes look so fabulous and this one is no exception. Lael Hazan: I have not tried making my own sausages yet, though I was just thinking about it the other day. I am definitely going to have to look into it as it sounds like fun! Kevin, this looks like some seriously good soup… thank you so much for sharing this recipe!!! This is definitely a recipe for me to come back to as soon as winter kicks in here in Sydney. Looks absolutely delicious! Double Smoked Bacon … let me just take that in. The soup sounds delightful! I know some of the best soups I have made have been inspired by flavors I had out. I love taking those flavors and making them my own! This soup is excellent especially with the addition of the cream. This is a keeper. Amazing! Easily in the top 5 easiest and best recipes. An instant staple for cold weather that will impress at dinner parties. Thanks for the post. Kevin – this soup looks AMAZING. I'm always down with any new way to use cabbage – it's my absolute favorite vegetable, and it really pairs with bacon so well. I'm definitely going to try this one! I ACTUALLY made this soup tonight (not just drooled over the picture), and it tastes just as good as it looks! My husband loves it! It was wonderful–loved the mustard! If you stir in the mustard, you get the taste with each bite, and the grains pop between your teeth…so good. Incredibly good soup. Dollop of spicy, grainy mustard was a stroke of genius. I've been following your blog for a while now and tried many recipes. Every single recipe has turned out fantastically for a mediocre cook like me. Please keep posting because I absolutely love your ideas! Not sure what double smoked bacon is. Grainy mustard? and the type of beans… The recipe sounds wonderful and I would like to make it. Anonymous: Double smoked bacon is a smoked bacon that went through the smoker two times. Any smoked bacon will work though. Grainy mustard is a mustard where all of the grains of mustard have not been ground into a paste. You should be able to find the grainy mustard in most grocery stores in with the other mustards. (I commonly use the Maille brand.) I use cannellini beans but any white bean such as Great Northern and Navy would also work. Kevin, just made a chicken veg soup, cooking right now and just came across this recipe – this one I will have to make down the road-weather here in Alberta has been cold-minus 17 – soup weather, just have to make sure to pick up the sausage and other stuff for it, Question for you – have you ever tried "orzo" I just picked up a package and want to cook it in a tomato sauce base for a casserole with left over cooked chicken, but I keep coming across the way to cook it "follow the direction on the package to cook it" thanks and keep up the great blogging. Germaine: Orzo is a pasta and it is cooked like other pastas, about 7 minutes in boiling water and it should work well in a casserole! I hope that you do get the chance to try the soup! I'm going to try this soup for a potluck next week and have to triple the recipe. Any problem with that? Anonymous: If you have a pot large enough for it tripling it will be ok. Enjoy! Oh wow….I've been meaning to make this for days and I finally got the chance this evening. What an incredible soup! Definitely making it again. A huge hit with the whole family 🙂 I didn't have celery but I subbed in Bok Choy (added the leafy parts later on so they wouldn't get super mushy) and it's delicious! Thanks! Kevin – this looks so good! I have a half head of cabbage that's looking for a home and I think this should be it! Holy Smokes! I made this soup tonight for dinner and it was deeeelicious! Excellent combination of flavours. The seedy mustard was definitely a nice touch! This soup was even better than you made it look. I made it last night and we both loved it. It is, of course, even better today. The grainy mustard just made the soup! Only regret is not making a double batch… I'm thinking of making your "Hungarian Mushroom Soup" today…. and if I can find the last ingredients locally (gochugaru and mochi) I will be starting your Kimchi 2.0 recipe today! just made this tonight. was fantastic. I had added some parmesan cheese just b/c it was sitting in the fridge and seemed like it would pair well, and it was fantastic. I could see replacing the meats for strong smoky cheeses for a vegetarian version – maybe gouda and parmesan. also thinking cauliflower could be a good addition – especially for a vegetarian version as it would add some better texture. also, you cut out some of the cream for extra beans, but people who are on a diabetes or ketogenic diet could go the other way – go halfsies on the beans (I used 1 can beans for a double recipe, and it was still wonderful) and add the cheese and cream for thickening. I just made this soup using fresh sausage ,both ham and chicken broth. I added three sliced potatoes. It is absolutely delicious. A definite keeper. I had enough to freeze a couple quarts for future lazy days. Thanks for the great recipe!